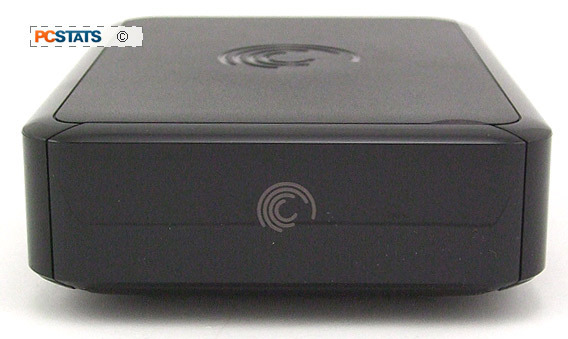 Front of the GoFlexTV HD with the hard drive bay flap closed. Hidden behind the fold-down door is a proprietory external hard drive port for Seagate's FreeAgent portable hard drives. 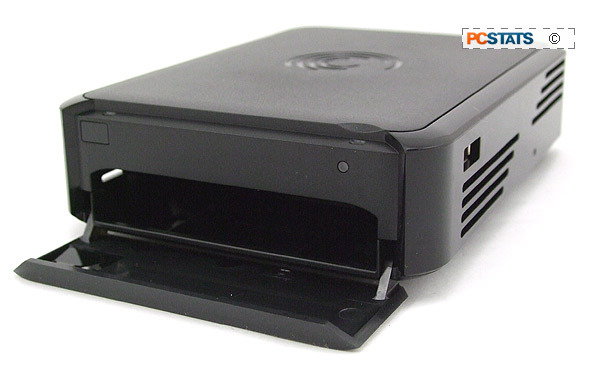 This little slot is the best selling point of the Seagate GoFlexTV HD media player in PCSTATS' opinion. 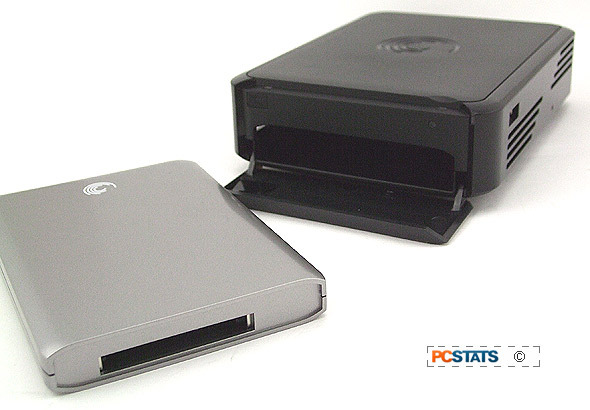 If you don't already own a Seagate FreeAgent (see PCSTATS review here) portable hard drive, check it out. 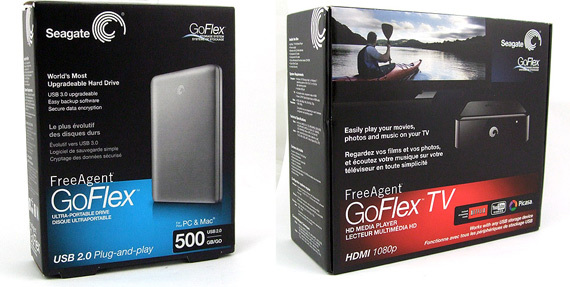 These portable storage devices are incredibly handy by themselves and superbly compliment the GoFlex TV HD media player. The 500GB Seagate FreeAgent GoFlex portable hard drive at left compliments the Seagate GoFlexTV media player quite well. The hard drive and media player are sold separately. Although the hard drive bay is essentially just a SATA hot swap connector, it only accepts Seagate's pocket sized portable FreeAgent SATA hard drives. Nevertheless, a portable FreeAgent hard drive will let you store 500-1500GB of data in one location, circumvent Media Sharing over a dodgy network and the capacity limits of USB thumb drives. 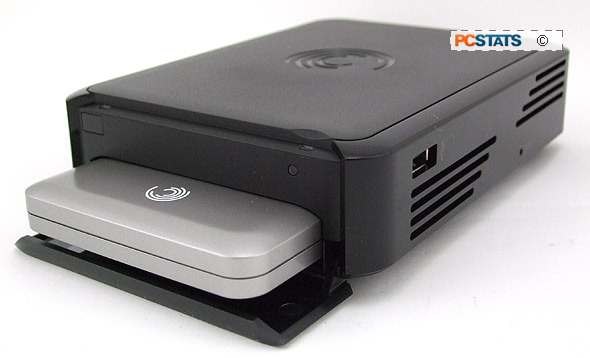 External Seagate FreeAgent portable hard drive can connect to the Seagate GoFlexTV if you already own one. 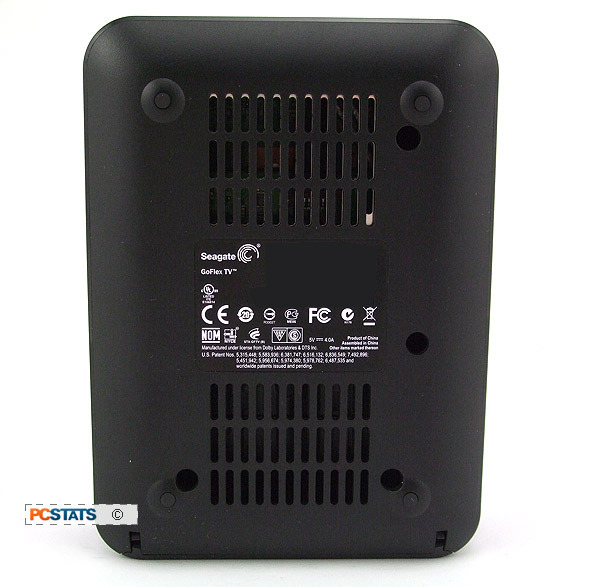 In our time playing with the Seagate GoFlex TV HD we found the FreeAgent hard drive dock indispensible. Rather than running Cat5 cable out to the GoFlex TV HD, we simply loaded up the portable hard drive with movies and plugged it into the GoFlexTV HD. The new content was immediatly indexed and quickly accessible. The one thing the GoFlexTV HD cannot do is record content or download content streamed from the likes of YouTube or Netflix movies. Even with the portable hard drive in place, the storage is only for media playback. Minimal air vents cool this fanless media player. A few hours movie watching will bring it to a toasty temperature, but the silence is golden.